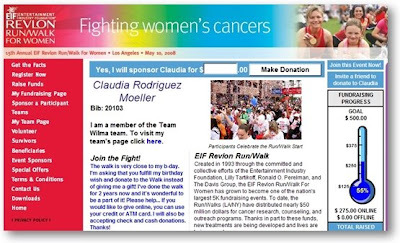 Another way to empower people to champion your cause and turn donors into fundraisers, in addition to Widget Technology, is to allow them to create their own personal fundraising page on your organization's Web site. By giving your constituents tools, such as social network and widget applications you are arming them with the necessary tools to big your biggest fans. Personal fundraising pages are becoming common practice with charities that put on sizable events, such as walk-a-thons, rides, etc. However, let me encourage you to expand your thinking about the usage of this tool, such as in disaster relief fundraising, matching grant campaigns and the phase of a captial campaign. You organization does not need to be putting on an event to use this tool. If you are a private school and need to raise money for exercise equipment, then give your kids, parents and alumni a fundraising goal and this application and get out of their way. Here is one example how these campaigns work. Send an email to your family, friends and co-workers asking them to support you. 1. A call to action with link. 2. An image of you. 3. A compelling image that represents the nonprofit. 4. Your personal fundraising goal. 5. Use some kind of graphic to indicate your fundaising progress. 6. The nonprofit's fundraising goal. 7. A viral component so recipients can forward it onto others. 8. A brief description about the nonprofit with a link to learn more. 9. A personal message from you with a link to read more compelling information about your motivation behind this specific effort. 10. In the case of an event, provide the when and where. 11. Indicate the names of the other people who have already donated. 12. Challenge the recipient to personally get involved beyond their financial gift. 13. Provide the recipient with a link to make their own personal fundraising page. The next thing to provide, if the recipient decides to give, is an affriming email, which indicates the amount of their gift along with a link back to the charity's Web site where they can see more compelling content about the campaign. Do you have any recommendations of service providers who can provide this personalized fundraising page tool?